Instead of the fact that in the late XVI century there were some legends about North-Western coasts of America in Russia, more exact information refers to the XVIII century, when Russian navigators and hunters began to penetrate that area. That was the time when settling and those lands systematical exploration in geographical, ethnographical and other relations began. Although the main reason of getting into North America was its wealth in fur-bearing animals. In 1719 Ivan Evreinov and Fedor Luzhin were charged with the task to describe the area near Kamchatka and answer the question about the Asian-American connection (at that time these continents were considered to have this connection). Two expeditions of Vitus Bering and A.Tchirikov (1725-1730, 1733, 1741-1742) for discovering the lands between Kamchatka and America were fit out. 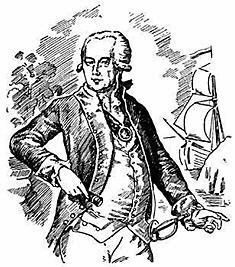 In 1766 6 Aleutian islands took out Russian citizenship, found by a merchant Adrian Tolsty. In 1781 honored citizens Grigorii Shelikhov and Ivan Golikov founded a private company for fur-bearing animals hunting in Alaska and the Pacific Islands, new lands discovery and trade with local population. And in 1793 at their request Spiritual Mission was sent and the church construction was allowed. In 1799 Irkutsk merchant Mylnikov joined Shelikhov and Golikov. Russian-American Company was created. Primary capital came to 724 ,000 rubles and was divided into 724 shares. The participants goal was a hunting for fur-seals and fur trade. The Main Company Administration was founded in Irkutsk. The Company received a Granted Document and a privilege to use all trades, crafts and establishments for 20 years, located along North-Western coast of America from 55 degrees of the Northern latitude to the Bering Straight and further, including the Aleutian and Kuril Islands. The Company received a right to discover the lands not only higher than 55 degrees of the Northern latitude but to the south of it. The Company was allowed to acquire any discovered land into Russian Empire, found settlements and build fortifications, trade with neighbor states, hire any class of free people. It had to take care of the Spiritual Mission in America and the Christianity spread among discovered peoples. In 20 years this privilege was prolonged. The Company had trade relations with China, California, Chili and tried to establish connections with Japan and Mexico, the Sandwich Islands (Hawaii). The main exported goods were pelt, baleen, walrus tooth, beaver spring. Food was the main import, and especially bread, which became much more expensive after the gold rush in California. The difficulties of trade connections with Russia through Siberia caused Russian round-the-world expeditions (Kruzenstern and Lisyazkii 1803-1806), charged with the task to make scientific explorations besides the goods transportation. The Russian-American profits were so impressive, that a share price in 1000 rubles in 1799 increased up to 3727 rubles in 1800. The aristocracy representatives and the Emperor’s house members took part in the Company deeds together with the merchants. That was the reason that the Main Company Administration was transferred to St. Petersburg from Irkutsk in 1800. Irkutsk kept a branch of this department in the previous building. 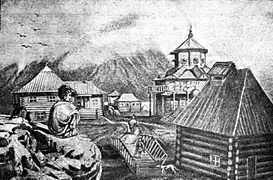 The southernmost Russian-American possession was Fort-Ross, a small colony of Russian people in California, which existed in 1812-1841. In 1815 there was an attempt to colonize the Sandwich Islands (Hawaii), but it failed. During the Russian-American Company work, the Christianity spread was held among local population. In 1796 the Holy Synod appointed a special archierei (priest), but a promoted to the rank of bishop Irkutsk Eparchy vicar Ioasaf died together with ship and its crew on the way to Alaska. Later a monk Herman (canonized in 1970) contributed to the faith strengthening by his life sacredness and ascetic exploits among the Aleutians. He introduced not only the Christian morality but agricultural skills. When after an epidemic on the Kadyak Island, many children became orphans, he founded an orphanage house on the Elovy Island. The most contribution to the American nations enlightenment belongs to the first bishop of the Kuril, Kamchatka and Aleutian Eparchy (founded in 1840) Innokentii Veniaminov. He was canonized in 1978. Many Aleutians began to read and almost all Creoles were literate thanks to him. The schools were opened within the churches, where the priests were instructors. The most talented students were sent to St. Petersburg or Irkutsk, where they were educated on the Company expenses. They studied commercial science and necessary specialties for the Colony (gunsmith, ship-building, smelting and others). In 1859 in Novoarchangelsk the Common School of Russian-American colonies with English and German language classes was opened. In 1867 the Russian possessions in North America were sold to the USA for $7200000. The treaty was signed by Russian ambassador de Shtackel and American Secretary of State Seward. Ceremony took place in New Arkchangel on the 30-th of October 1867.